Jacob's Ladder is a commonly sold but completely under-used plant. This may sound somewhat oxymoronic but it's true. I see it for sale at practically every nursery I visit (it's even a popular seller! 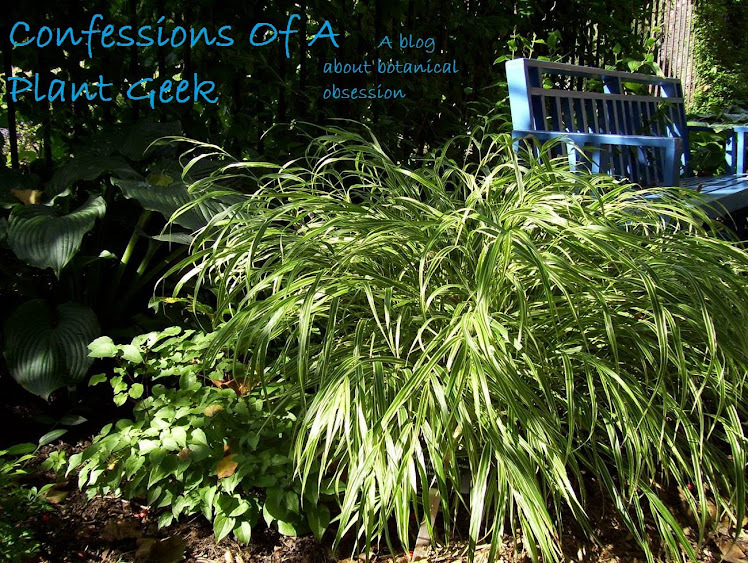 ), gardeners talk about it, there are articles galore regarding a myriad of species and varieties; but I rarely see it when I visit gardens. Why? Part of the reason may be that people are enamored with the variegated variety 'Brise D'Anjou', which is a beautiful plant but a terrible performer. It's probably the top-selling Polemonium on the market. My record for getting it to survive in a garden is 3 years. 3 years of shrinking back while planted in a consistently moist organic-rich soil. It works great for annual color in the garden or in pots, but don't plan on it being a long-lived part of your grand design. There are certainly other varieties out there, most of them are better suited to life in the garden. If you need a variegated variety, 'Touch of Class' or 'Stairway to Heaven' are better performers but they still need some extra attention in the soil and water department. 'Heaven Scent' in May - Look how dark that foliage is! Of the many varieties of Jacob's Ladder I've grown, one stands out as a great plant. It should (in my opinion) be the one selling like hot-cakes, talked about, written about, and present in every garden. 'Heaven Scent'. This wonderful variety comes from Brent Horvath, supreme plant geek and benevolent overlord at Intrinsic Perennial Gardens. 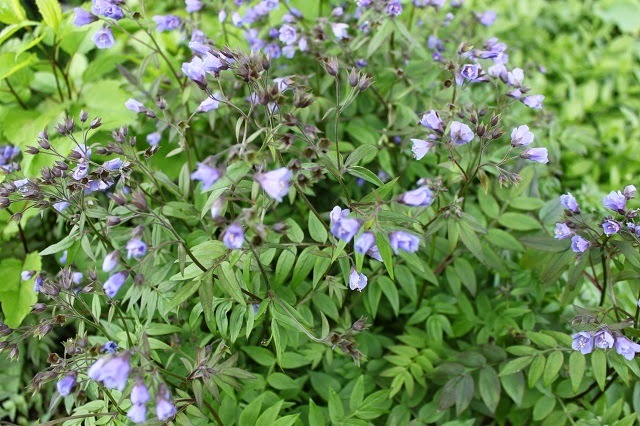 Polemonium 'Heaven Scent' originated as a cross of the US native Polemonium reptans and the Japanese Polemonium yezoense and definitely combines the best of both parents. Reddish-purple foliage emerges in spring and forms a tidy mound of ferny leaves with oppositely arrange leaflets resembling a ladder; hence the common name of Jacob's ladder, referring to the biblical ladder to Heaven. In May bluish-purple flowers are formed on 18-24" stems and last into June. These flowers are intensely fragrant and smell of grapes. This is the plants mystery attribute; I've never noticed fragrance on P. yezoense and only a light fragrance at best on P. reptans. As the flowers fade in June and the summer heats up, the foliage will start to turn green. Like most Jacob's ladders, 'Heaven Scent' prefers a rich soil that is consistently moist and partial shade. It's a vigorous grower that flowers well from a young age. I like to pair it with colorful broad-leaved plants like Hosta 'Fire Island' or 'Tiny Bubbles' and Heuchera 'Green Spice', 'Caramel' or 'Stainless Steel'. It offers good form and textural contrast in summer and great color contrast in spring. Another great pairing is with finer leaved plants like sedges or grasses. Pennsylvania sedge (Carex pennsylvanica) or or Korean Feather Reed Grass (Calamagrostis 'Brachytricha') are excellent companions. I'm going to say it one more time... everybody needs this plant in their gardens! Go buy one! I want to see (and smell!) this when I visit gardens. Hi Judith, sitting in water could certainly be a problem for Polemonium as they don't like being too wet. Let it dry down a bit between waterings and always drain the ceramic pot after you water. They are also truly perennial and will go dormant as the season comes to a close. You don't say where you live, but throughout most of the US they should be going dormant now. It will also benefit from a cold period. An unheated garage would be ideal if you need to keep it in a pot. Being a perennial it will perform best in a garden setting, but it can certainly be kept in a pot for a few years if needed. He also has a new intro out this year, Polemonium 'Soft Rain'. I may need to buy a copy of your Polemonium booklet! Hi Polemonium! I've managed to buy two of these beauties from Wyevale Garden centre in the UK. They were discounted to £3 each. It might be worth checking if there is one near to you? Let me have your address and I can send you a copy, we will be looking out for Heaven Scent in the garden centres this spring.